Learn how to format corrupted and unreadable SSS USB flash drives .Download SSS USB MPU v2.162 and format SSS6677, SSS6690 and SSS6691chip controller . SSS USB MPU v2.162 has been designed to reformat unrecognized and unreadable Solid State System chip controllers "SSS" .3S USB Mass Production Utility Ver 2.162 support repairing the following SSS chip flash drives "SSS6677, SSS6690 and SSS6691" .3S USB MPU v.2162 can fix SSS format errors such as write protected flash memory , Raw flash drive "0 bytes " ,Please insert disk error message ,Windows unable to format disk and other format errors . SSS USB MPU v2.162 support formatting SSS6677, SSS6690 and SSS6691 chip controllers , so please don't use it with different chip controller .3S USB MPU v.2162 may repair the following chip controller "TC58NC6688/SSS6690-B0 ".You must determine your USB flash disk chip vendor first , you can use Chip genius software or USBDeview V2.30 utility . 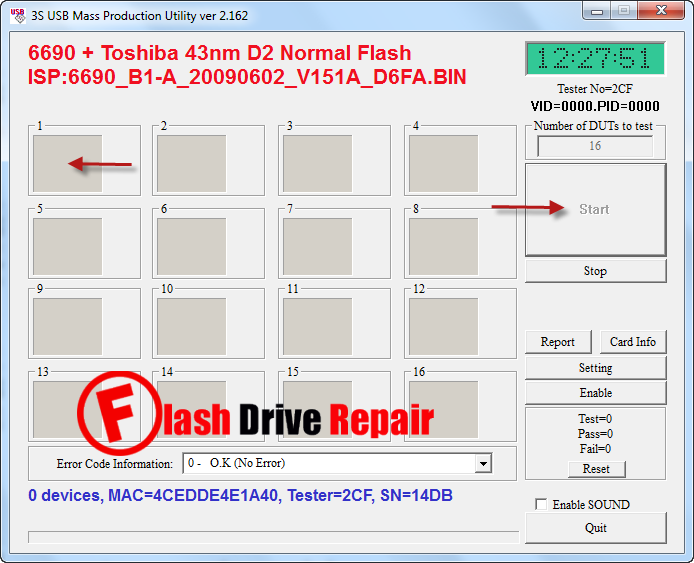 How to update SSS flash drive firmware? First download 3S USB MPU v.2162.rar from download links below . Insert corrupted SSS USB flash disk to your Computer . Extract 3S USB MPU v.2162.rar and open U3S_MP_V2162.exe. As you see in the next picture ,Choose the chip controller as chip genius report result then double click on it . 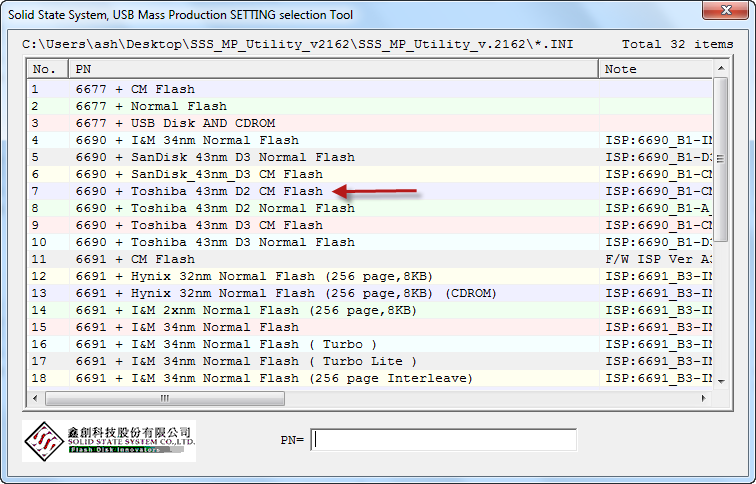 After you choose your USB flash chip vendor ,SSS USB MPU v2.162 interface will be opened .If your chip controller is supported , you will see flash info appears on the program interface . 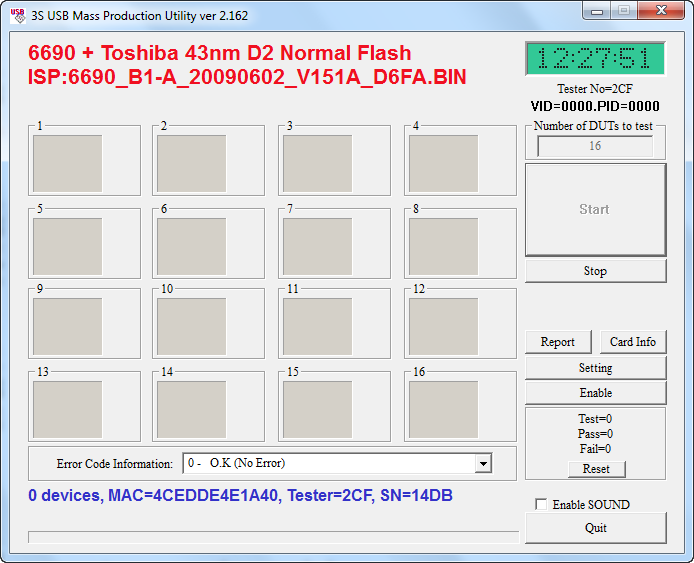 Click Start to begin formatting your flash disk . Wait until finish formatting your flash drive . hi, i have the same problem as you. Did you fix it already? let me know pls. Someone help?